Arcadian Shores Golf Club opened in 1974 and was renowned golf course architect Rees Jones' first solo design. 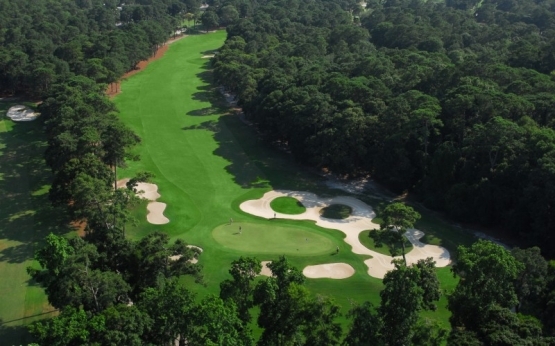 Jones had a wonderful natural setting for this classic design that has been one of Myrtle Beach golf’s premier courses since it's beginning. The golf course features beautiful tree-lined fairways, scenic lakes, well-placed bunkers, lush Tifton Bermuda greens, and distinctive contouring. It will challenge golfers of every ability and is sure to provide fun for all golfers. The course offers five sets of tees with a yardage of 6,857 from the championship tees. In a ranking by the Myrtle Beach Sun News, golf experts voted two holes, #2 and #13, as part of the “Dream 18”, a compilation of the best 18 holes in Myrtle Beach. Arcadian Shores has long been one of Myrtle Beach’s favorites and would be an exceptional addition to your Myrtle Beach golf package. Book your Myrtle Beach golf trip today! I played Arcadian recently and found the golf course to be in excellent condition. They have removed several trees since I played it last. The greens were in as good of condition as I have seen them in some time. Fairways and tees also in great condition. Good time.